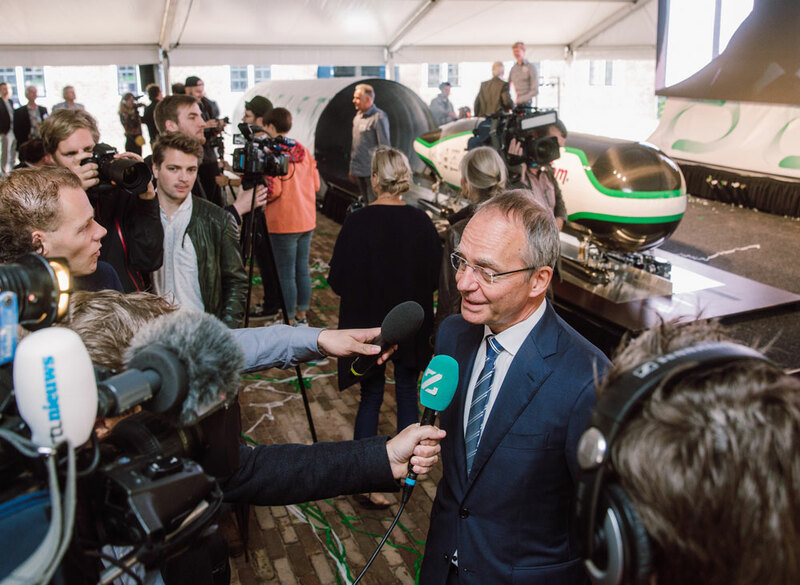 Economics Minister Henk Kamp led the unveiling of the Delft Hyperloop on the TU Delft campus. With this transport pod the team from Delft battled against 30 other teams at the end of the summer during the finale of the American competition by Elon Musk - the entrepreneur behind Tesla and SpaceX - and they won! During the ceremony Minister Kamp spoke of his pride for the team, calling the Delft Hyperloop an example of “innovation at a global level”. This new method of transport could lead to economic growth, and increase the competitiveness of the Netherlands by allowing for faster, more efficient and sustainable travel. A 1.6km test tube was built for the big finale where one by one the Hyperloop pods got to zoom through. Experts from Tesla, SpaceX and university professors tested the design and performance of the pods. The Delft Hyperloop team gave everything in the months before the competition to try and win. The early signs already looked promising. After a stellar presentation in June 2016 that received an abundance of praise the team went on to prove they had what it took to win. While the students kept themselves occupied coming up with a pod that can quickly and safely make it through the tube, at Hike One we thought about the experience of the passengers. Why is that so important? “People want to be able to look out the window, even if the Hyperloop is going 1,200 kilometres per hour,” says Hyperloop team member Tijmen Veldhoen. We came up with calming visualizations for the virtual screens that span the entire wall of the pod. These virtual windows make the travel experience feel natural and give a sense of calm. 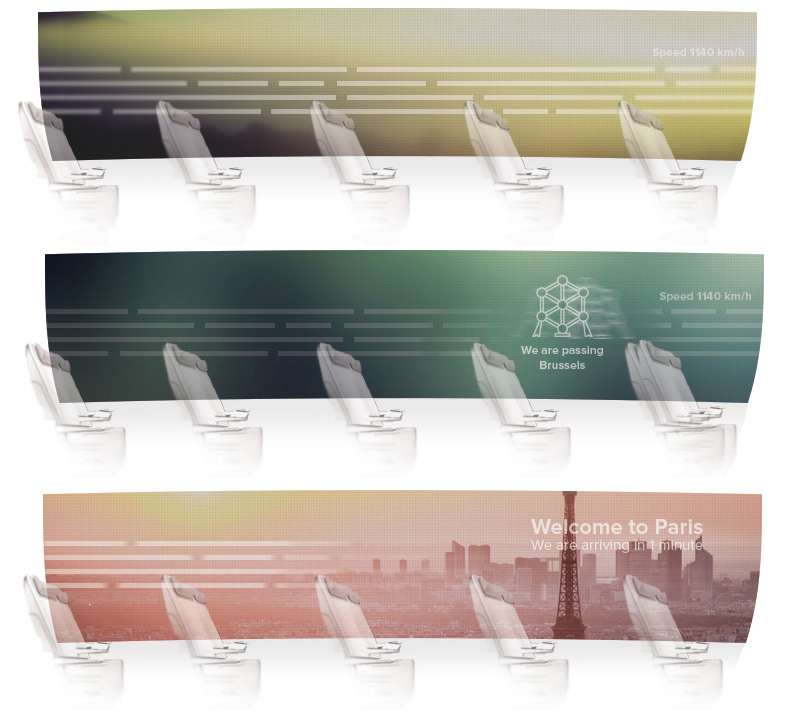 Passengers can see images of the city from where they are leaving at departure. As soon as the train gains speed, animations with calming colors appear to prevent any claustrophobic impulses. The animation at the top edges creates lines that run across the entire length of the pod. These are suggestive of the speed of the vehicle. Other travel information could also be shown here, such as notable places and landmarks being passed, and the actual speed in the form of kilometres per hour. Is the destination in sight? Then the color wheel changes to images of the arrival city. From their ergonomic and comfortable seats - part of the work of interior designers from TU Delft - each passenger has an individual monitor. From these monitors they can access all types of information. Such as the weather forecast, events at their destination, and practical information about the journey, like speed and arrival time. Next to consulting on the experience of passengers we helped the Delft Hyperloop team share their story. It was important that the story be told in a way that everyone can understand as the subject for many sounds more sci-fi than reality. Together with De Voorhoede we made a visual story-based landing page, and INDG accompanied this with some impressive 3D renderings. 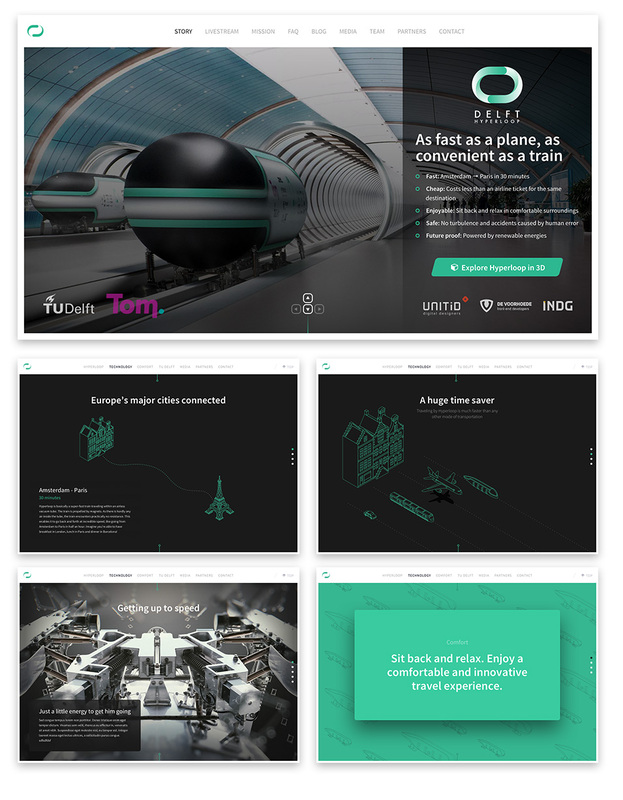 Check out the results on the Delft Hyperloop website. After the competition students from the TU Delft team went on to form Hardt, a professional company focused on further developing the Hyperloop pod. Partners of Hardt include Tata Steel and Nederlandse Spoorwegen. Why use micro-animations in your design?